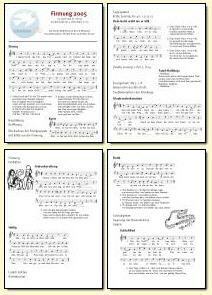 Did you ever have to create a songsheet like this? Then you'll know it's a laborious task. Every song has to be created and saved to a different file. The verses, captions and other text have to be created and arranged in a word processor or drawing program, and then each song has to be exported in a graphics format and transferred to the document. It has to be placed, arranged and often also stretched or shrunk (which causes a loss of quality). 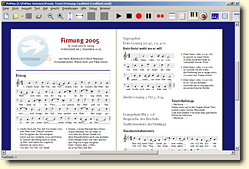 As well as a music notation program you'll need Word and maybe Powerpoint or Corel, and if you discover a wrong note at the end, you have to start all over again. This is all solved by PriMus, the first notation program which is able to handle multiple pieces of music, text and graphics in a single document. Instead of eight or ten files you only have to work on a single file. Instead of changing between different programs for different tasks, you need only one program. And instead of puzzling over a bunch of snippets, you can view and edit everything in one place. Sophisticated text function and seamless integration of graphics and pictures allow you to layout the complete songsheet within PriMus. Notes and text can easily be changed at every stage, and positions of all elements can be tweaked to your liking using the mouse. Finally PriMus frees you from the photocopier. The powerful printing function scales and arranges the pages so that you can just take it from your printer, fold it, and you are done! It couldn't be easier!